Canada’s research reactors are generally smaller than its power reactors, and their designs vary greatly, because they are specialized to a variety of academic, scientific, and industrial needs. 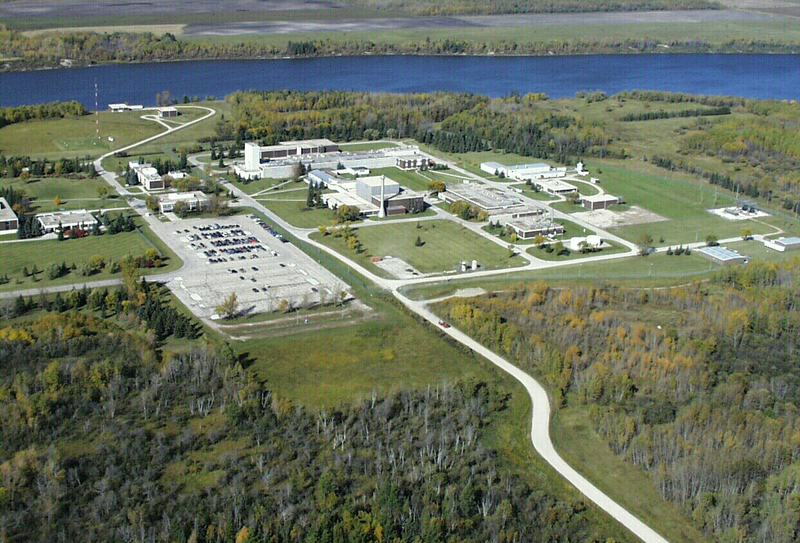 First opened in the 1940s, the Chalk River Laboratories is owned and operated by Canadian Nuclear Laboratories (CNL). 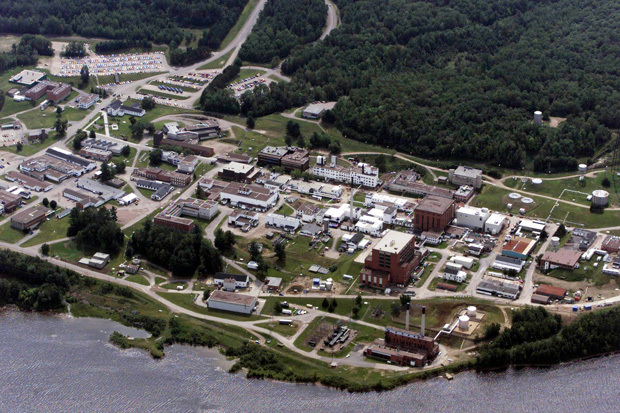 Chalk River is one of Canada’s more complex nuclear sites, including two operating research reactors, fuel-fabrication facilities, hot cells, isotope production, Class II facilities and waste-management facilities. Chalk River Laboratories in Chalk River, Ontario. Until it was permanently shut on March 31, 2018, the National Research Universal (NRU) reactor at Chalk River played a major role in Canadian nuclear research. The NRU produced a large amount of the world’s medical isotopes, which are used for diagnostic purposes. 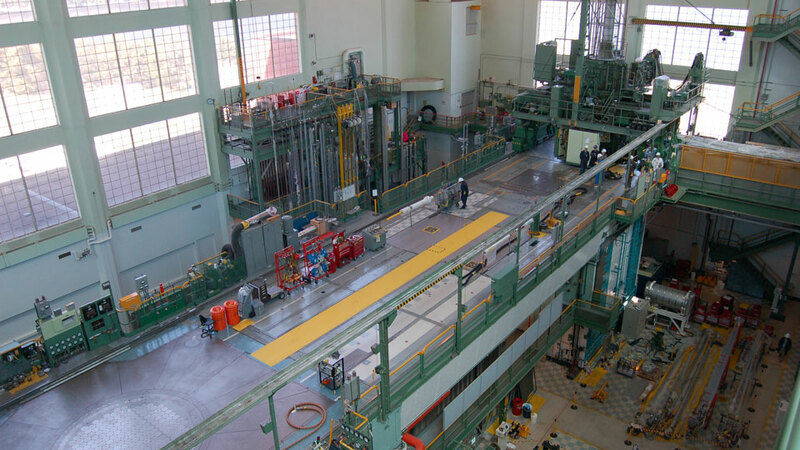 The NRU was also Canada’s only major materials and fuel testing reactor used to support and advance the CANDU reactor design. Finally, the NRU produced neutrons used by the National Research Council’s Neutron Beam Centre to investigate and study industrial and biological materials. The NRU when it was in operation. Source: CNL. Also located at Chalk River is the ZED-2 research reactor. Launched in 1960, the ZED-2 is a very low-power (200 watt) reactor that has provided CNL with the capability to develop and test fuel-bundle designs and fuel arrangements, and to simulate incident scenarios. The reactor is still used for experiments in support of CANDU reactors and for the development of next-generation reactor concepts. The McMaster Nuclear Reactor in Hamilton, Ontario. Source: CNSC. 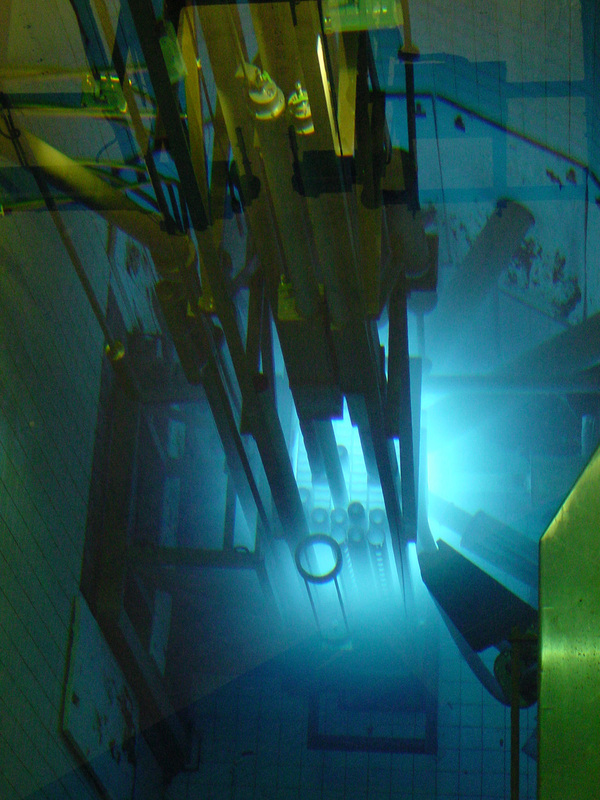 The McMaster Nuclear Reactor (MNR) is a pool-type reactor, with a core of enriched uranium fuel moderated and cooled by light water. The reactor can operate at powers of up to 5 MW. The MNR is the only Canadian medium-flux reactor in a university environment. It supports McMaster University’s nuclear engineering program and other research programs. MNR’s neutrons are used in nuclear physics, biology, chemistry, earth sciences, medicine, neutron radiography, and nuclear medicine. Typical applications of neutron radiography at MNR include the testing of turbine blades for aircraft engines and corrosion of aircraft components. SLOWPOKE (Safe Low-Power Critical (K) Experiment) reactors are low-energy, pool-type nuclear research reactors designed by CNL in the late 1960s. The design was intended to provide a source of neutrons for research and teaching institutions. The reactor is installed below ground, in a concrete pool filled with water, at atmospheric pressure. The core of a SLOWPOKE reactor sits in a pool of light water, which provides cooling and shielding. The reactor core is located at the bottom of a sealed aluminum container vessel, approximately 60 cm in diameter. A SLOWPOKE reactor. Source: The Canadian Society for Mechanical Engineering. Research reactors operating at powers less than 100 kW are generally considered very low-risk facilities; a SLOWPOKE reactor operates at 20 kW, and SLOWPOKEs have been in operation for over 30 years and have demonstrated a record of safe operation. the Royal Military College of Canada SLOWPOKE-2 in Kingston, Ontario. Canada has several research reactors that have undergone decommissioning over the years, including the NRX, ZEEP, PTR reactors at Chalk River, several SLOWPOKE reactors, and the WR-1 Organic Cooled Reactor at Whiteshell Laboratories in Pinawa, Manitoba. Three research reactors have also been partially decommissioned: MAPLE-1 and MAPLE-2 at Chalk River and a SLOWPOKE at Whiteshell. Canada also has three partially decommissioned prototype power reactors: Gentilly-1, Nuclear Power Demonstration (NPD) and Douglas Point. 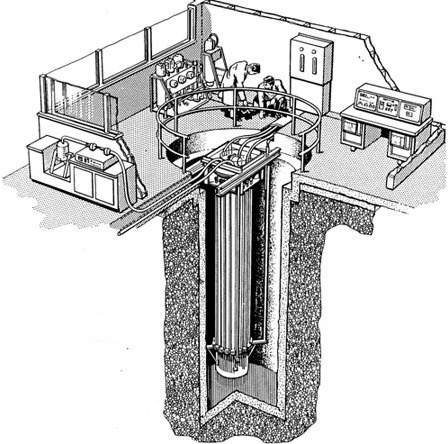 Decommissioning of reactors usually involves a period of safe storage: after decades of use and hundreds of thousands of hours of operation in a typical reactor life-cycle, many of the reactor components themselves have become radioactive; the radiation levels must be allowed to drop before they can be disposed of safely.